Hello Facebook Messenger, Goodbye BBM! In one shot, Facebook may have just killed SMS (text messages) and BBM! It seems Facebook is launching ‘Facebook Messenger’ which will allow you to send messages through an app directly to your Facebook contacts without ever having to log in or open the site. The move is brilliant. Although it could take away some traffic from the site, it entrenches Facebook as a permanent means to stay in touch with friends. Why bother trying to port over friends to various messaging apps when you already have everyone on Facebook? Utter brilliance. I have always been frustrated by the fragmentation of the messaging market. Some people are die-hard BBM users, and others use various other apps but none of them communicate to each other. So BlackBerry users were stuck chatting with other BlackBerry users and iPhone users were stuck with other iPhone users. Now, everyone will be able to chat – for free – with all of their existing Facebook contacts. Which, for most people, is their largest most complete network. The app will only be for iOS and Android though, so you BlackBerry users finally have no excuse for sticking to BB for BBM. Although it does not seem to be available in Canada yet it will most surely be rolling out to us shortly – with increasing competition from Google+ now, it seems Facebook has gotten the message (pun intended). 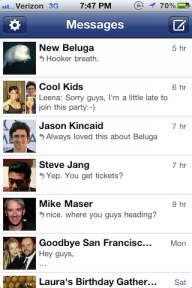 So, are you all over the new Facebook Messenger?